View of “Chu Enoki: Enoki Chu,” 2015. 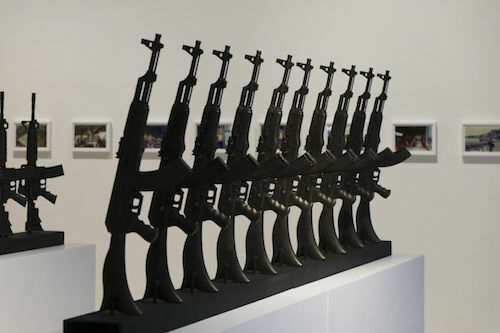 Japanese artist Enoki Chu’s London debut includes forty cast-iron replicas of AK-47 (Kalashnikov) and AR-15 (Colt) machine guns, lined up like samples in the boutique windows of this gallery (AK-47/AR-15", 2000–03). Inside, there is also a massive replica cannon, one of a series of demilitarized weapons which this tiny, mischievous seventy-year-old has built for his alternate militia: a “Life Self Defense Force,” preaching self-empowerment against the repressive forces of society. He often takes the weapons to friends’ parties or weddings, firing flowers or confetti in deafening celebration. On the walls, photographs trace his Going to Hungary with HANGARI, a performance the artist staged across Europe between 1977 and ’79, for which shaved all the hair off one side of his body before traveling (hangari means “half shaven” in Japanese). Other images document designs for immaculate military prototypes that he welded together over the years from scrap metal and parts supplied by colleagues working in local heavy industry. Enoki’s conceptual intent is opaque. It is suggested that his often disturbing inventions and performances highlight the incongruous strangeness he has always felt as an artist in everyday environs. Enoki worked for decades in a Kobe factory, pursuing artistic obsessions only in his spare time. Yet in Japan, the artist has become iconic: the missing link between the radical anti-art experimentations of the 1960s, grounded in disruptive public interventions, and more familiar post-’80s “neo-pop,” such as Kenji Yanobe’s postapocalyptic sci-fi survival machines. This ambitious show provides a representative sample of his life’s work.